A knowledgeable interior designer once said, “Trimmings rise and fall with the state of the economy.” Having been in the design industry for over 20 years, we have seen this cycle and know it to be true. It was most evident when the economy went into recession after the 2008 financial crisis; trimmings were the first detail to get cut. After ten years, with the economy in better shape and more disposable income and confidence, the minimalistic tendency has run its course and the trim-tide has turned. This was glaringly apparent at the Southeastern Designer Show house in Atlanta this year. Interior designers, both seasoned and new, used trimmings as an element of customization. Design is cyclical and the traditional tendency of embellishment is returning. Fringe fits into this comeback category: this spring saw over a 300 percent search uptick for “fringe pillows” and “fringe furniture” on Pinterest—but 2018 fringe is oh-so-different from decades past. Whereas old fashioned fringe could be seen as stuffy and grandmotherly, the new wave of trim is exciting, modern and glamorous. People want more and more things to feel custom and unique, not like they will see it at a neighbor’s house. Fringe is one of the easiest ways to take a simple pillow, window treatment, whatever it is, and make it uniquely your own. Recently we’ve seen it in the usual places, like on couches, curtains, and pillows. But we have also seen it on desks, the seats of chairs, and even a staircase. People are using it in new and different ways, wanting to make a statement. So, how does one incorporate fringe into their own home? We suggest a gentle touch. The adage “Less is more,” is a good rule to follow. 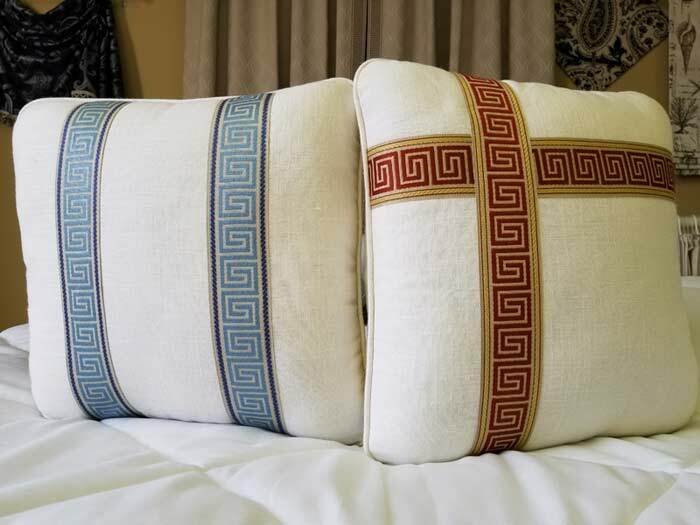 Embroidered tapes add dimension while twist cords enhance pillows. Tassel fringe is a great way to personalize any window treatment. Even a tassel tieback to hold back draperies is an excellent way to incorporate trimmings in a room.